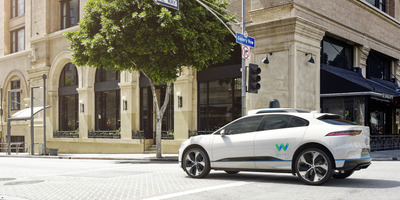 JLR/WaymoWaymo could be worth up to $US175 billion. Morgan Stanley says Waymo, Google’s self-driving car unit, could be worth $US175 billion, its highest valuation yet. That number is up $US100 billion from the bank’s first estimate of $US75 billion, thanks to taxis, logistics, and licensing. Follow Alphabet’s stock price in real-time here. The valuation estimates keep climbing for Alphabet‘s self-driving car unit, Waymo. In a note to clients Tuesday, Morgan Stanley estimated the division, which graduated from Google’s secretive X lab to full-fledged subsidiary in 2016, could now be worth a whopping $US175 billion thanks to three key business areas. Elsewhere on the Street, Waymo is valued anywhere from $US119 billion by Mark Mahaney of RBC Capital Markets to $135 billion by Eric Sheridan of UBS. Of course, there are lots of assumptions in Morgan Stanley’s model that must come to fruition first. When you combine those advantages with Waymo’s additional disruption of long-haul trucking, the opportunity is worth $US90 billion, Morgan Stanley estimated. The smallest chunk of Morgan Stanley’s new valuation for Waymo comes from potential licensing opportunities like it’s already done with Fiat Chrysler. Morgan Stanley has a $US1,325 price target for shares of Alphabet – about 4.6% above where the stock was trading Tuesday but below Wall Street’s average of $US1,364. The stock is up 17.7% since the beginning of 2018.